Segment makes it easy to send your data to Responsys (and lots of other destinations). Once you've tracked your data through our open source libraries we'll translate and route your data to Responsys in the format they understand. Learn more about how to use Responsys with Segment. Before you enable Responsys in your destinations page, there are a few things in your Segment destination settings you must set up. Once the setup is complete, you’ll be able to use .identify() calls to add records to Profile Lists, Profile Extension Tables and .track() calls to add records to Supplemental Tables. Choose the pod that hosts your Responsys account. 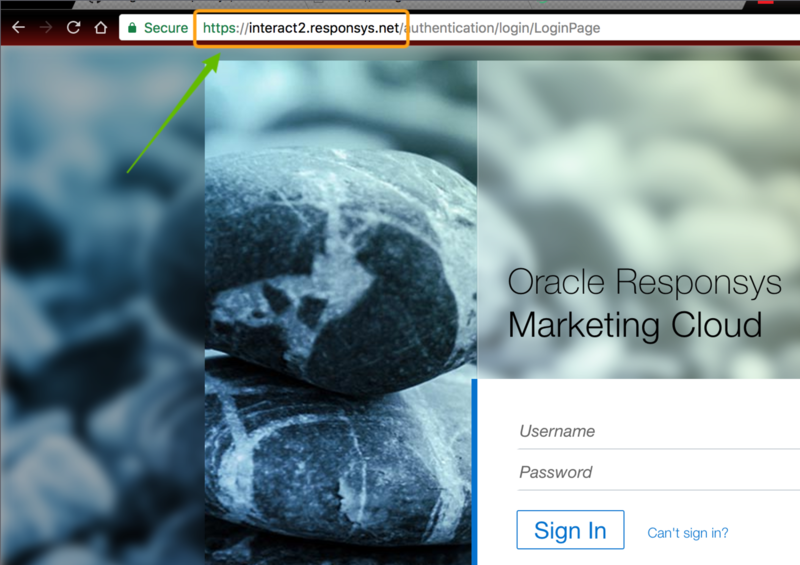 NOTE: You can find your account’s endpoint by simply going to your Oracle Responsys login screen and looking at your url. Enter your username and password for your Responsys account. We require these credentials in order to retrieve an auth token from Oracle in order to send data to your account on your behalf. Please enter the name of the default Folder you’d like to send your Segment data to. Don’t worry, you can override the default folder name on a per-call basis via destination specific options for .identify(). Please enter the name of your default Profile List where you would like to store your .identify() calls. Again, this can be overriden via destination specific options on a per-call basis as seen here. Choose whether you’d like to set your Default Permission Status to be OPTIN or OPTOUT. Unless configured otherwise, the default will be OPTOUT. If you are unsure the implications of this settings, you can read more about it here. Once you have entered these required settings, you are ready to integrate your Oracle Responsys account through the Segment platform! Upsert records to a Profile List. Extend that record by upserting a corresponding record in a Profile Extension Table. IMPORTANT: In order to merge records properly, our destination requires that all .identify() contain at least a userId or a traits.email! Responsys does not have an API to create Profile Lists so you must create one manually inside their UI. If you would like to send records to a Profile Extension Table (PET), this destination can either create the PET for you or you can simply enter the name of any of your existing PETs. The match column name will be the userId and email (must send at least one). So be sure to include the userId or traits.email in your .identify() calls! All you have to do is enter the desired name of your PET in your Segment destination settings. This would create a PET where its columns would be NAME, AGE and GENIUS. Since email is mapped already in your Profile List, we will not create a duplicate column in your PET. We will also automatically set the column type according to the value of the trait you’ve sent. We will run a quick validation such as checking the length of any string values to make sure we set the appropriate STR### as well as checking any number values should be an INTEGER or NUMBER in Responsys. The following is how we map the column types as well as what the default type will be in the event more than one valid column type can be set (i.e. A string value that had 24 chars will still default to STR500. NOTE: Responsys does not have a boolean column type, so we will just stringify to 'true' or 'false'. IMPORTANT: Since Responsys will reject any messages that try to merge columns that do not exist in a given Profile Extension Table, we will make sure to only send accepted column names. So it is very important to keep your tracking code, the destination settings, and your table schema in Responsys in sync! If you already have a Profile Extension Table you’d like to use, simply enter the name of the list in your settings. Note that we will only send traits with matching column names in your schema, meaning that we will drop any traits that are not pre-defined in your PET before sending the request. If you need more flexibility or need to add different users to various Folders or Profile Lists/Extension Tables, you can use our destination specific options. The above call will override all your default names in your Segment destination settings. It is a great way to implement programmatic bucketing of your users into specific folders and lists! You can send Segment’s .track() events to add (NOT merge) records to any Supplemental Table. However, it is currently not possible to pull all the valid columns for a given Supplemental Table as you would with Profile Lists, meaning that you must explicitly map your the names of your track events and properties and provide their corresponding Reponsys table names and column names and types. Similar to how our .identify() call works, you can opt to let Segment create the Supplemental tables by providing all the necessary mappings in your settings. We will try to upsert records to that table name first and if it doesn’t exist, we will create the table for you using the exact column mappings you have provided in the Segment destination settings. You do not need to map every column to Segment properties if you do not wish to do so, as Responsys allows you to update records partially, with the exception of Primary Keys. IMPORTANT: If you make any updates to your Segment .track() or Supplemental Table schema without updating the changes in your destination settings, you can risk records not being added correctly to simply having the messages rejected entirely. Especially if the changes relate to Primary Keys configuration. As long as you provide the exact mappings that reflects the existing schema of your Supplemental Table, we can add records. You do not need to map every column to Segment properties if you do not wish to do so, as Responsys allows you to update records partially, with the exception of Primary Keys. All Supplemental Tables must have at least one Primary Key. Responsys supports up to four per table. It’s very important that whichever properties you choose to set as one of the Primary Keys always have unique values. Otherwise, you will risk overwriting historical records in your Supplemental Tables. Note that if you are using more than one primary key for a given table, only one of those need to send a unique value in order to successfuly add a new record. The easiest way to ensure you choose a unique Primary Key is to enable Use Segment Message ID. This feature will send SEGMENT_MESSAGE_ID as a primary key column with the value being Segment’s messageId field. Since this property is uniquely generated by Segment, you can ensure that you do not overwrite any historical records in your tables. Note that this does count against your limit of four Primary Keys per table. If you’d like to use this feature for an existing Supplemental Table, you can modify your schema and add the column SEGMENT_MESSAGE_ID. If you do not do this but enable this option, all your track events will be rejected by Responsys. Furthermore, if you do not provide Segment with all of the primary key column names, the message will be rejected by Responsys API. In order to attribute the event record in your Supplemental Tables with the matching records in your Profile Lists or Profile Extension Tables, we recommend enabling the Map Segment UserId option. If enabled, we will send the userId attached to the .track() payload as a Responsys field. IMPORTANT: Make sure if you are mapping an existing Supplemental Table, you have created a field in your table called CUSTOMER_ID_! Otherwise if you have not created the table and is relying on Segment to do so, we will create the field CUSTOMER_ID_ and set the field type as STR500. Since we still accept .identify() calls without userIds so long as it has traits.email, you can also enable this for your .track() events if you want to attribute event records via email. We will lookup context.traits.email (which is automatically cached if you are using a mobile library), properties.email, and fallback on the userId field if it is a valid email address. IMPORTANT: Make sure if you mapping an existing Supplemental Table, you have created a field in your table called EMAIL_ADDRESS_! Otherwise, if you have not created the table and is relying on Segment to do so, we will create the field EMAIL_ADDRESS_ and set the field type as STR500. How do you handle nested objects? We will flatten any traits or properties that are nested objects of arrays and objects with the delimiter of an underscore. You should enter address_street as your Segment Property Name. I’m seeing a ‘Merge cannot be done on one field’ in the Segment debugger! This error occurs when you try to upsert a record to a Profile Extension Table but you did not provide any additional traits other than what we used to match the columns. For PETs, we use your userId or traits.email from your .identify() calls to upsert the record. You need to send at least one other trait that would map to a field in your PET. Use these fields to map your Segment event names to Responsys Supplemental Tables. We’ll only send events and properties that you specify. Please enter the default Folder Name that holds the provided Profile List and Profile Extension Table. Please enter the default Profile List. Make sure that the Profile List is inside the provided Folder Name. Please enter your account’s password. Please enter the name of your default Profile Extension Table. The pod that hosts your Responsys account. Simply check your url during your login screen. This is required to any requests to your account. The default is interact2. Please enter your account’s username.